Women are consistently underrepresented in engineering workplaces, especially in senior management positions, and face a high attrition rate [1,2]. To address this, organizations must become aware of the impact human resources policies and practices have on diversity in the workforce. Our study engaged 39 Canadian companies that employ engineers and focused on their human resources policies and practices. We examined the connection between the practices and percentages of women at different levels of the organization, pay, and tenure relative to men. In our study, women were paid less and had shorter average tenure than men, at all career levels. Only 18.4% of engineers at the non-managerial level were women in the 39 organizations. This percentage dropped considerably at managerial and senior leadership levels. Organizations that sought women for leadership positions, and provided them with training and mentorship, had more women leaders. Women stayed longer at workplaces that offered paid maternity and paternal leaves, and a culture that supported gender diversity. 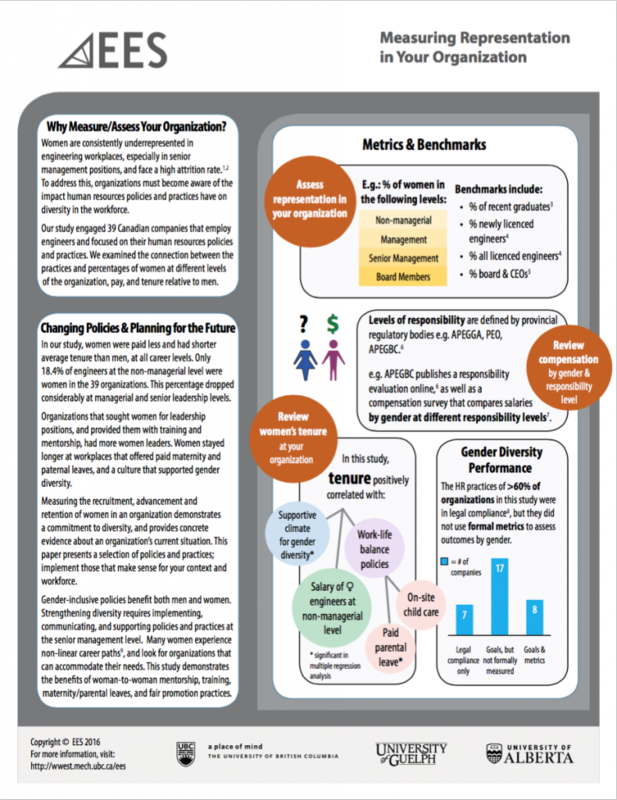 Measuring the recruitment, advancement and retention of women in an organization demonstrates a commitment to diversity, and provides concrete evidence about an organization’s current situation. This paper presents a selection of policies and practices; implement those that make sense for your context and workforce. Gender-inclusive policies benefit both men and women. Strengthening diversity requires implementing, communicating, and supporting policies and practices at the senior management level. Many women experience non-linear career paths and look for organizations that can accommodate their needs. This study demonstrates the benefits of woman-to-woman mentorship, training, maternity/parental leaves, and fair promotion practices. 1. Hunt, J. (2010). Why do women leave science and engineering? (NBER Working paper 15853). Cambridge, MA: National Bureau of Economic Research. 2. Hill, C., Corbett, C., & St. Rose, A. (2013). Why so few? : Women in science, technology, engineering and mathematics. Washington, DC: AAUW.